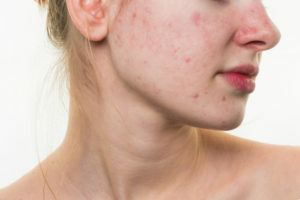 Micro-needling can sound a little scary to some people, but this surprisingly gentle and innovative procedure can significantly reduce acne scars when used with PRP therapy. Platelet-rich-plasma (PRP) therapy uses your own natural plasma, which is found in the blood, to rejuvenate the skin in a targeted area. As an extensively trained facial plastic surgeon, Dr. Eugenie Brunner uses this non-surgical approach to help patients eliminate these bothersome lingering blemishes. As part of your treatment a small amount of blood will be drawn and processed to make a platelet-rich-plasma serum. Then the Eclipse MicroPen® Elite, an advanced device that uses tiny needles, will be used to create small grooves or channels in the affected area. The body is then stimulated into healing these micro-injuries by pumping collagen into the area. As a result, hyperpigmentation, common signs of aging, and acne scars will also “heal” and become less noticeable. Before, during, and after your micro-needling procedure, PRP will be applied to the skin to further boost the rejuvenating effects and provide the substances needed for your skin to regenerate. Your comfort is a high priority, and most patients report minimal discomfort. Treatment should be quick, often as brief as 15 minutes, and we will prepare the treated area with a numbing solution first. You can return home immediately after the micro-needling session, and makeup can be used to cover the minor effects like swelling and redness. These symptoms should subside quickly. Ready for better skin? Talk to our medical team to learn more.